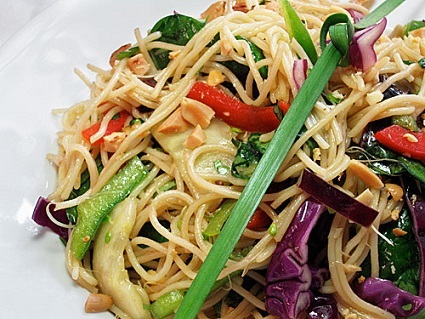 This is a really delicious Chinese Noodle Salad and it is made special by a secret restaurant salad dressing recipe. The hardest part of the recipe is getting all the ingredients together. The ingredients are available from most grocery stores. The dressing really is what makes this salad recipe work so well. 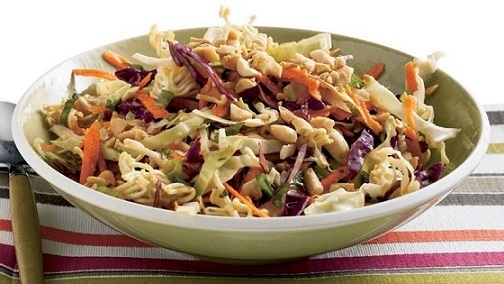 From young to old, everyone seems to love this Chinese Noodle Salad. I often prepare this one for summer get to gathers at home and for a summer change-of-pace at the restaurant. The recipe is flexible in substituting or adding whatever vegetables you might like and it goes well with so many other dishes. Preparation time: 35 minutes. Serves 4-5. 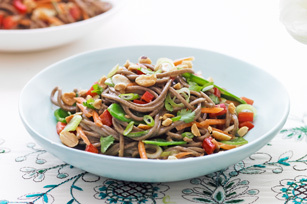 Garnish with shredded carrots, green onion and peanuts and Enjoy! Enjoy your delicious Chinese Salad and the company of those you share it with!